Today, we’re showing you how to create your very own super cute Handbag Gift Bag! We’ve created a brand new video tutorial featuring all the steps you need to make yours with a few simple cuts and scores. You’ll be well on your way to making your own, perfect for adding a thoughtful finishing touch to gift wrap. 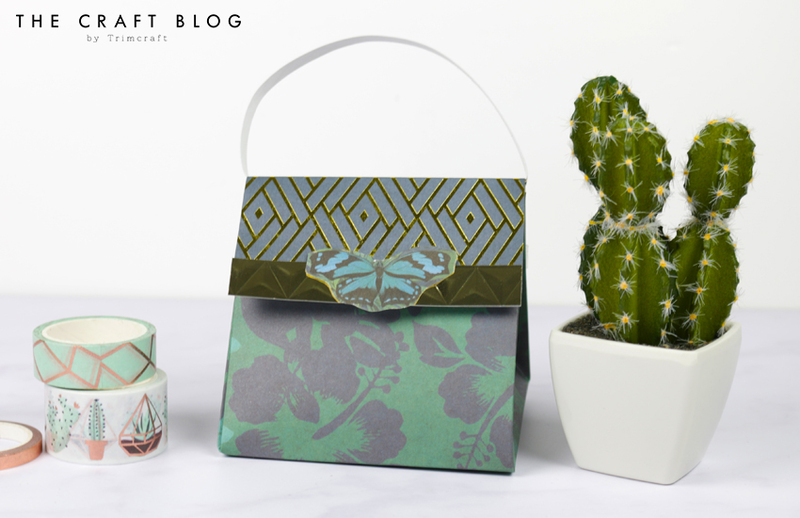 We’ve used the stunning Botanical Beauty papers from First Edition for this make, but you can choose whichever papers you’d like to create your own. 1. Cut a sheet of your 12" x 12" paper to 30cm square. 2. Score at 10cm and 20cm on all sides so that you create a grid of nine 10cm squares. Score diagonally in each corner and two centre squares as shown below. 3. Fold along the score lines to create the shape of your bag. 4. To create the closing of the bag, cut a 10 x 10cm piece of decorative paper, score at 4 and 5cm along side and fold. Adhere this to the bag using double-sided tape to create a flap. 5.Cut a 1cm strip of paper for the handle and adhere to the underside of the scored section of the bag flap. 5. Add a velcro dot to create a fastening for the bag. 6. Emboss a piece of mirror card, cut a strip and adhere to the bottom of the flap to decorate. 7. Embellish with a butterfly fussy cut from one of the papers. What do you think to this tutorial? Will you be making your own version of this craft? We’d love to see if you do, so don’t forget to #Trimcraft when sharing to social media and to upload it to the Inspiration area!